Pictured below is Martha Dismont, Executive Director of the Family Centre; Jill Husbands, Country Corporate Officer of Marsh & McLennan Companies, Bermuda and Chairman of Marsh’s Bermuda Charity Committee; and Cathy Belvedere, Executive Director of Agape House. Friends of Hospice is a charity that helps to enhance the quality of life for all hospice patients and their families. The donation to Friends of Hospice will support its Quality of Life programme which includes Adult Day Care for members of the community who have serious illnesses and are mobile enough to come and spend a day once a week at Agape House, Bermuda’s first and only in-patient hospice. The day includes meditation, massage therapy, art therapy, lunch, manicures and pet therapy. Participants provide a support system for one another and, for most, Adult Day Care is the only day of the week that they get out of the house. Family Centre offers prevention and intervention services for families to help them be successful. Family Centre works with children who suffer from abuse, neglect and other emotional challenges, and with their families. The donation will be applied to the Child & Family Counselling programme, which helps families out of crisis, creates safety and rebuilds positive relationships through empowerment of family members, breaking negative cycles and moving forward with better care and protection. These services consistently achieve an average of 95 per cent success in helping families to reduce behaviour problems, improve parenting skills and get along better as a family. There are four counsellors and one psychologist working for the Child & Family Counselling programme and it currently serves 100 children and families. “Thank you to Marsh and Guy Carpenter for their generous donation to Friends of Hospice,” said Cathy Belvedere, Executive Director of Agape House. 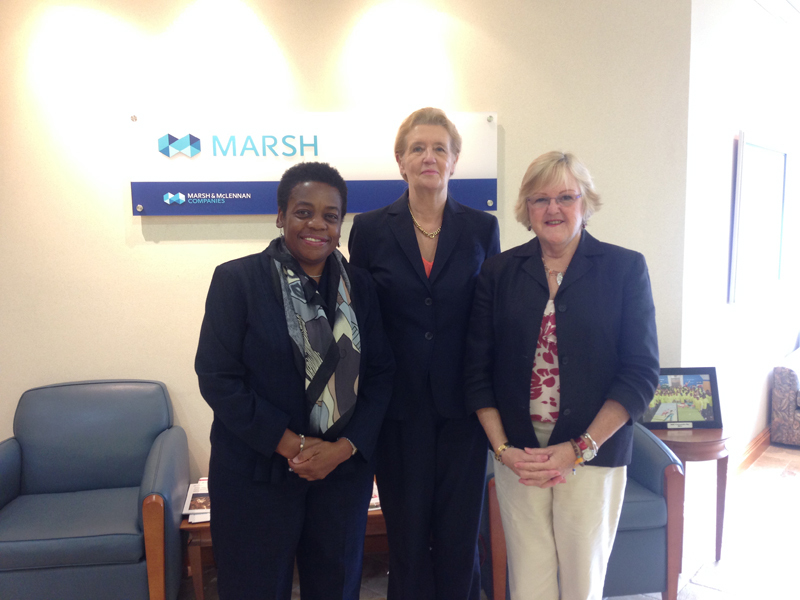 “Both Friends of Hospice and Family Centre are important organisations who do valuable work in Bermuda,” said Jill Husbands, Country Corporate Officer of Marsh & McLennan Companies, Bermuda and Chairman of Marsh’s Bermuda Charity Committee. To learn more about Friends of Hospice, visit, www.friendsofhospice.bm. For more information about Family Centre, visit www.tfc.bm.